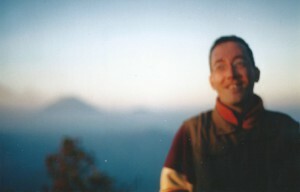 Since his early childhood, The Wandelgek, was attracted by mountains. In his teens a holiday was planned every two years in Austrias Alpes and in between in the hills of Belgium, Germany and Luxembourg. Not surprising that when the Wandelgek first went on his own for a holiday abroad, he visited Luxembourg, Belgium and South Limburg (Dutch province) (1989). Then followed one after the other rugged mountain region: Scotland 1990, Lapland and Norway in 1993, Slovakia in 1996, Austria, Tibet and Nepal in 1999, Switzerland in 2000, Italy in 2001, Xinjiang and Kyrgyzstan in 2002, Indonesia in 2003, Kenya and Tanzania in 2004, Vietnam in 2008, Italy in 2010 and France in 2011. 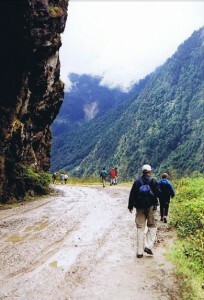 The Wandelgek hiked in 1999 on the Friendship Highway from Lhasa in Tibet to Kathmandu in Nepal. This route runs mostly parallel to the Himalayas. At the monastery of Rongbuk and Everest base camp are some of the highest mountains in the world to see and between (Old) Tingri and Dholalghat (Nepal) of more than 5000 m the road descends through the Himalayas steeply down to about 500 m. Very spectacular. From beautifully colored stone plains, surrounded by Himalayan giants with eternal snow, descend the gap in that first still pretty bare and rough with occasional shabby bushes. As the descent progresses, the environment ever greener, warmer and you hear more and more bird sounds, while also increasing the number of waterfalls. The Himalayas, also Himalaya or Himalayas called (Hindi: हिमालय, Himalayas, Tibetan: ཧི་མ་ལ་ཡ, Urdu: سلسلہ کوہ ہمالیہ, Salsal-cultures Himalay; Chinese: 喜马拉雅 山脉, pinyin: Xǐmǎlāyǎ Shānmài) are a mountain range in southern Asia. 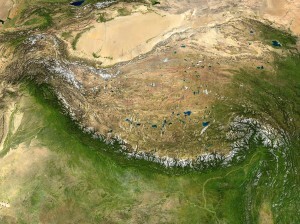 The Himalayas are the separation between the high plains of the Tibetan Plateau in the north and the river plains of the Indian subcontinent in the south. In a broad sense, the adjacent Karakoram, Hindu Kush, Pamir and Kunlun can be seen as part of the Himalayan mountains because they belong to the same geological system. If only the actual Himalaya is taken, its total length spans around 2500 km. The width varies between 200 and 400 km. The Himalayas contain more than 40 peaks over 7,000 meters high and nine peaks over 8,000 meters. This includes the world’s highest mountain, Mount Everest (8850 m high). The Himalayas are administratively under the powers of India and China (Tibet) and the smaller mountain countries Nepal and Bhutan. The extreme west of the mountains, falls under Pakistan. The Himalayas are the principal source of water for some of Asia’s largest rivers that hundreds of millions of people use as drinking water. The Himalayas therefore play an important role in Indian and Tibetan mythology, religion and literature. The name comes from the Sanskrit Himalayas and is a combination of the words hima (snow) and Layas (town): literally “abode of snow”. The mountain range is considered by both Hindus and Tibetan Buddhists as the residence of the chief gods. In the course of history the Himalayas draw, besides millions of Hindu and Buddhist pilgrims, different groups of visitors like Indian princes/rulers in the summer and because of the cooler mountain climate western explorers and colonial administrators seek out the relative coolness of the mountains. From the 19th century, mountain climbers and tourists visit the Himalayas. The latter often search for spiritual meaning. 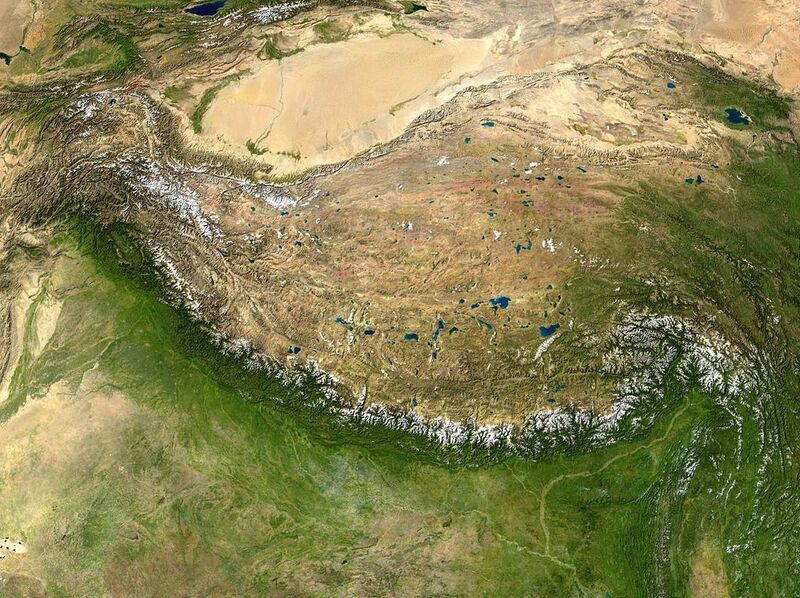 The Himalayas is 2,400 km long and between 150 and 280 km wide, with a total area of around 600,000 km ². The mountain range forms an arc from Pakistan in the northwest to the south of Nepal and Bhutan, and finally back to the northeast to Arunachal Pradesh, where the Himalayan passes into the Hengduan Shan. In the northwest the Himalayas are bordering the Karakoram (with K2, the second highest peak in the world), which in turn is attached to the Pamir and Hindu Kush. All of these mountains are part of the same system (called Alpide belt), which runs from Western Europe to Southeast Asia and has the same geological origin. Late in the afternoon the Wandelgek arrived at the monastery of Rongbuk. Everest was almost completely surrounded by clouds. That lasted until late in the evening, just before sunset, when suddenly all the clouds began to clear, which led to beautiful pictures of the absolute top of the world. After a cold and difficult night (I clearly suffered from altitude sickness), the next morning was very foggy. Double pleased with the view of the top on the previous evening. Mount Everest (Nepali: सगरमाथा, Sagarmatha, Tibetan: ཇོ་མོ་གླང་མ, Chomolungma, Qomolangma or Qomolungma, Standard Mandarin: 珠穆朗玛峰, Zhūmùlǎngmǎ FENG) is the highest mountain in the world. The mountain is 8848 or 8850 meters high and is located in the Himalayas on the border of Nepal and Tibet. In the nineteenth century, the then British colony of British India was mapped. 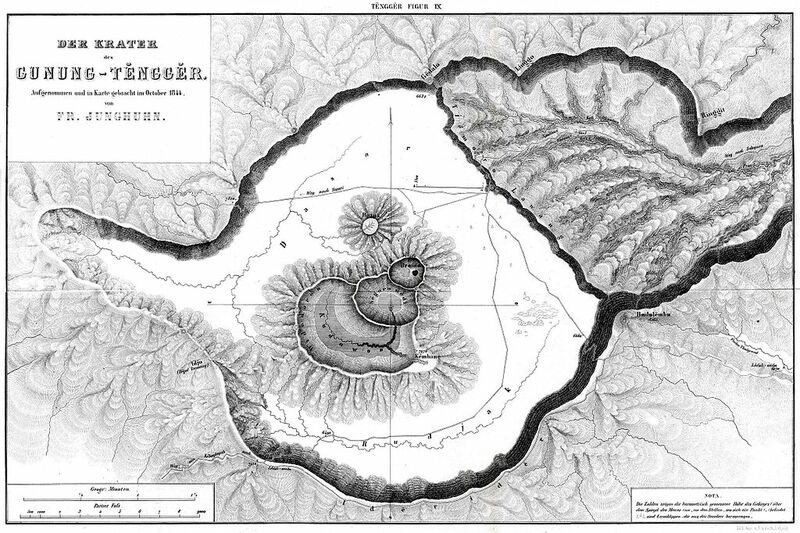 In 1856 the amount was determined by a mountain, which at that time Peak XV (Peak 15) was called. Because Nepal and Tibet were closed to foreigners, the surveyors did not know the traditional name of the mountain Chomolungma, and so was Mount Everest in 1865, its English name. This internationally common name is derived from the British geodesic Sir George Everest, the former chairman of the institute that carried out the measurements. The irony is that Everest itself always preferred the locally used names. The roof of the world attracts experienced mountaineers, but also novice climbers who are willing to pay huge sums of money to reach the top. Everest has a complicated and hard climb to the top, but compared to other eight-thousanders it is a relatively easy climb. However, the climb has enough dangers such as altitude sickness and harsh weather conditions. Until 31-12-2009 there were 4571 climbers who reached the top of the mountain. 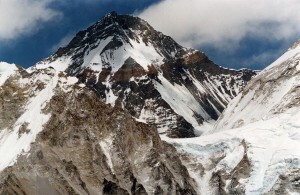 Mount Everest is an important source of income for China and Nepal. The cost for the compulsory licensing for climbing the mountain can be up to € 25,000. Lhotse Main peak 8516 m.
Lhotse Central (East) 8414 m.
Lhotse (Tibetan: ལྷོ་རྩེ, Wylie: lho Rtse; Nepali / Devanagari: ल्होत्से, lhotse; Chinese: 洛子峰, pinyin: luòzǐ Feng) is a 8516 m high mountain in the Himalayas. The mountain is located in the Mahalangur Himal, on the border between Nepal and Tibet. It is the fourth highest mountain in the world. Via the South Col (7925 m) Lhotse is connected to Mount Everest. 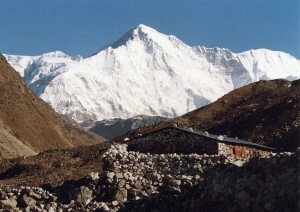 This mountain is one of the fourteen eight-thousanders; the highest mountain peaks in the world. Lhotse has actually three different peaks that all rise above 8000 meters. Before Mount Everest was conquered, there was little attention given to climbing Lhotse. Only in 1956 the mountain was climbed for the first time, as an alternative route to the summit of Mount Everest. Makalu is with a height of 8463 meters, the fifth highest mountain in the world and ranks among the fourteen mountains with an altitude of over 8000 meters. 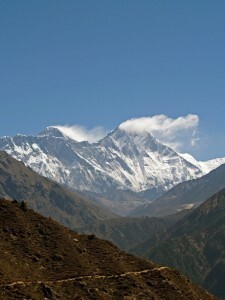 The mountain is located east of Mount Everest on the border between Nepal and Tibet. The first ascent took place in May 1955 by a French team led by Jean Franco, which succeeded for the first time to climb the mountain. All members of the expedition team reached the top of the 8000+ giant. On May 15, climbed Lionel Terray and Jean Couzy for the first summit of Makalu. The next day, May 16, Jean Franco, Guido Magnone and Norbu Sherpa Gyaldzen also reached the top. The other members of the expedition, Jean Bouvier, Serge Coupe, Pierre Leroux and Andre Vialatte were on May 17th at the top. 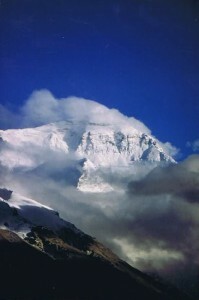 Cho Oyu (Tibetan: ཇོབོདྦུཡག, wylie: jo-bid-bu-yag, literally turquoise goddess; Chinese: 卓奥 友 山, pinyin: Zhuó’àoyǒu Shān or 乔乌雅 峰, pinyin: Qiáowūyǎ Feng; Nepali: चो यु, Choyu) is an 8000+ mountain giant in the Himalayas. The mountain is located in the central Himalayas, not far from Mount Everest and is the westernmost pillar of the Mahalangur Himal in the Himalayas. The border between Tibet and Nepal is on the summit of Cho Oyu. 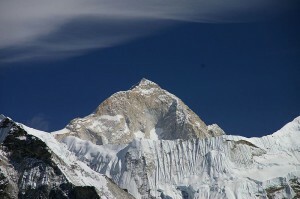 Cho Oyu, thanks to a new measurement in 1984, moved up to 6th place in the list of eight-thousanders. The measurement of 1984 gave an altitude of 8201 meters. The ascent of Cho Oyu is considered relatively easy for a mountain higher than 8,000 meters. The specified height of 7543 meters comes from the modern Chinese mapping. Some authorities give 7583 meters. The Changtse glacier flows north into the East Rongbuk glacier. It is possible that the second highest lake in the world is within the Changtse Glacier is at 6216 meters (20,394 ft). 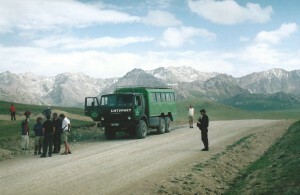 In the late summer of 2004 Wandelgek traveled the Silk Road in Central Asia. Part of the trip was a trip on the Karakoram Highway to the Karakol lake at about 3600 m altitude. 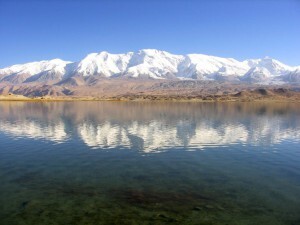 Around the Karakul lake located on the eastern side of the Pamir, are some of the highest 7000-ers of the Pamir. The Pamir (Tajik: Кӯҳҳои Поми, Kūhhoi Pomi, Kirghiz: Памир тоолору, Pamir Tooloru; Uyghur: پامىر ئېگىزلىكى; Chinese: 帕米尔高原, pinyin: Pàmǐ’ěr Gaoyuan) is a mountain range in Central Asia. It lies largely in the east of Tajikistan, but also on the northeast of Afghanistan (the Wakhan Corridor), far north of Pakistan, western Chinese Turkestan (China) and southern Kyrgyzstan. 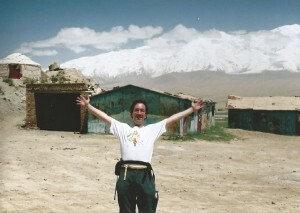 The highest peak in the Pamirs is the 7495 m high Ismail Samanipiek. 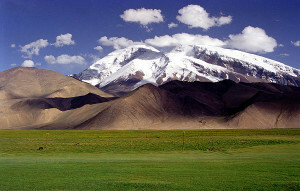 If the Chinese Pamir in the east are included, the Kongur (7649 m) is even higher. The mountain range is part of a series of mountain ranges which are also called the roof of the world collectively, a name that is translated from “Pamir” and originally used for the collective. In 1964, the Russians opened a road across the mountains. This 720 km long road winds from Osh in Kyrgyzstan to Choroeg in Tajikistan and goes over passes at altitudes of over 4,500 meters. Large parts of the Pamir are covered by snow throughout the year. The area has long, cold winters and short, cool summers. The annual rainfall is only about 13 inches, leaving few trees to grow. In the western part of the Pamir, coal is mined, but the breeding of sheep in the pastures is the main source of income. The Kongur or Kongur Tagh (Uyghur:, قوڭۇر تاغ Qongur Tagh, Mongolian: Хонгор Таг, Hongor Tag; Chinese: 公 格尔 峰, pinyin: Gōngge’ěr Feng) is a 7649 m high mountain in the eastern Pamir, under Chinese sovereignty at Sinkiang. 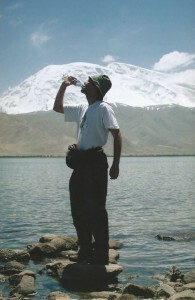 The mountain is the highest peak in the Pamir and the 37th in the world. 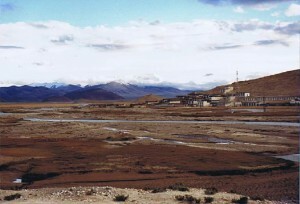 The mountain range surrounding the Kongur is sometimes called Kongur Shan (the Chinese 公 格尔 山, pinyin: Gōngge’ěr Shān). 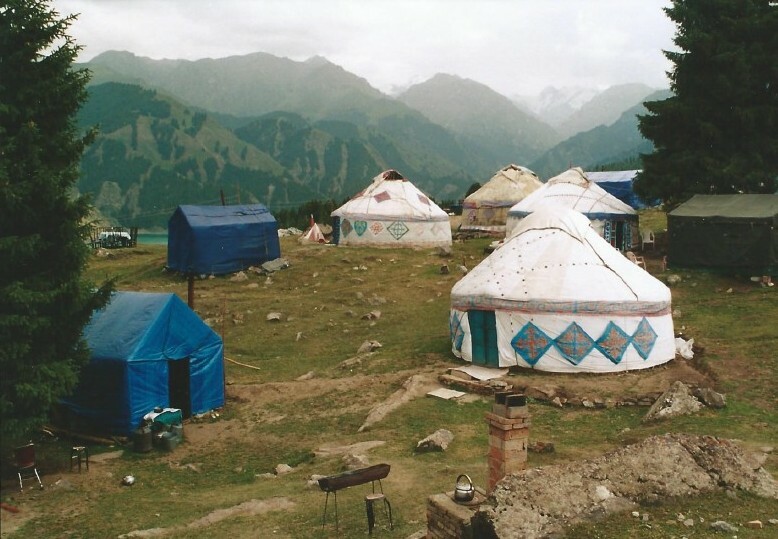 The Kongur is located in the far west of Xinjiang, near the border with Tajikistan, at about 110 km southwest of Kashgar and 90 miles north of Taxkorgan. Along with the Muztagh Ata in the south, the Kongur is towering above the Taklamakan desert in the east. Because of its remoteness, the mountain was discovered by Europeans in 1900. Since the construction of the Karakoram Highway through the area in the 70s of the 20th century, the mountain became easier to reach. The first attempt to climb the mountain was in 1956, but the mountain ascent proved more difficult than expected. 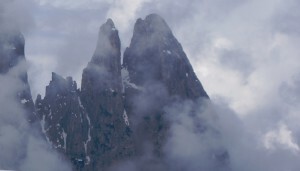 Because of bad weather the Kongur is considered extremely difficult. Only in 1981 did a British expedition led by Christian Bonington reach the top. In 1989, a second ascent by a Japanese team followed. The third ascent followed until 2004. Muztagh Ata or Muztaghata (Uyghur: مۇز تاغ ئاتا, Muz Tagh Ata, literally, father of icebergs; Chinese: 慕士塔格 峰, pinyin: Mùshìtǎge Feng) is a 7509 m high mountain in the far west of the Pamir, standing under Chinese rule in Sinkiang. It is the third summit in height in the Pamirs, after Kongur (7649 m) and the Kungur Tjube Tagh (7530 m). 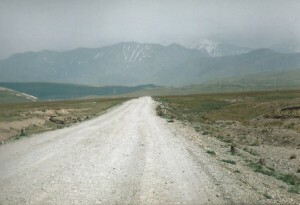 Muztagh Ata is located about 50 km north of Taxkorgan and 30 km east of the border with Tajikistan. In the west, the Karakoram Highway runs around the mountain. 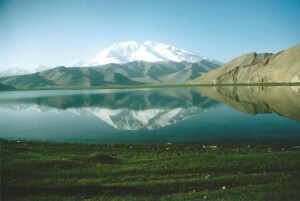 To the north is the Muztagh Ata connected with the higher Kongur. Together, these mountains Kongur Shan, form a chain that sometimes is named “Chinese Pamir”. The Kongur Shan is isolated from both the rest of the Pamir further west and the Kunlun further east. Due to the relatively flat flanks Muztagh Ata is considered a mountain easy to climb, considering its considerable height. It is one of the most often climbed 7000+ mountains. The first person who attempted to climb the summit was the Swedish explorer and geographer Sven Hedin in 1894. In 1900, 1904 and 1947 further attempts followed. The last expedition (1947) with British climbers Eric Shipton and Bill Tilman came very close to the summit but had to give up because of snow and extreme cold weather. 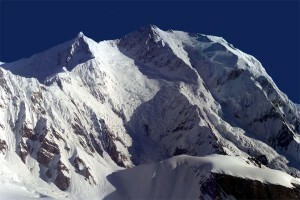 The first successful ascent followed in 1956 by a Chinese-Russian team led by E.A. Beletski. During the Silk Road journey which ​​the Wandelgek made in 2004 he also visited the Tian Chi lake where the Bogda Feng stands out. The Wandelgek traveled from Kazakhstan to Urumqi in the Chinese province of Xinjiang by train. This trip was following through an ancient Silk Road branch north of the Tien Shan. The Wandelgek traveled from Urumqi through a gap between the main part of the Tien Shan and Bogda Shan through to Turufan. After visting Turufan, the Wandelgek traveled from Turpanshan by train to Kashgar. This trip was on the northern route around the Taklamakan and north of the track were the Tien Shan which provides all the oasis towns on the edge of the mountains and the desert of water. Finally the Wandelgek traveled from Kashgar trough the Tien Shan, over the Torugart pass to Kyrgyzstan. The Tiensjan or Tian Shan is a mountain range in Central Asia, on the border region of Kazakhstan, Kyrgyzstan and China’s Xinjiang Uyghur autonomous region. In most languages​​, the Chinese name meaning the “celestial mountains” is used. The highest peaks in the Tian Shan are the Victory Peak (Pik Pobedy, Genis Čokusu 7439 m) and the slightly more northerly Chan Tengri (7010 m), which is located on the Chinese-Kyrgyz-Kazakh border triangle area and is the northern 7000+ mountain in the world (at least when the ice sheet is included). 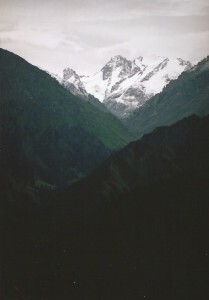 Between the two mountains lies the Eňilčekgletsjer, the largest of the Tian Shan. 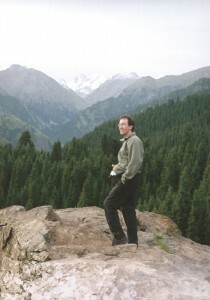 To the west lies lake Issyk Kul, which is the second largest mountain lake in the world. 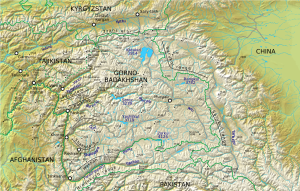 The southwestern continuation of the Tian Shan is the Pamir and the northeastern continuation is the Bogda Shan. The Bogda Shan is often icluded among the Tien Shan. 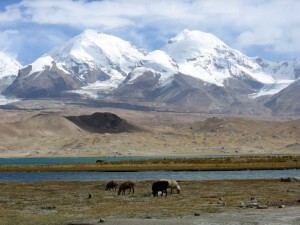 The highest peak here is the 5445 m high Bogda Feng which lies at the Tian Chi (Heavenly Lake). The main traffic route through the Tian Shan runs through the Torugart pass (3752 meters) on the border between China and Kyrgyzstan. 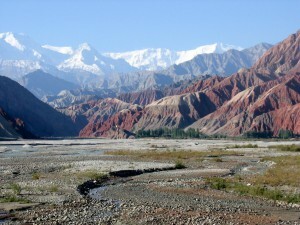 The Bogda Shan is a mountain range in China’s Xinjiang Uyghur autonomous region, east of the Tian Shan. 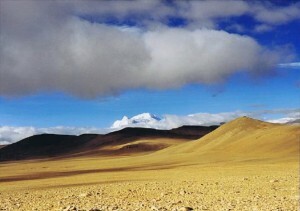 The highest peak, also known as the Bogda Feng, is 5445 meters high; of similar height as Kilimanjaro. The oasis city of Turpan is located on the southern flank of the chain. The ascent of the mountain by climbers is usually described as difficult. Only in 1981, the summit was reached for the first time by a Japanese group of climbers. The sides of the mountain have a slope of about 70 ° to 80 °. 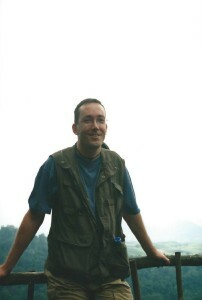 In 2002 Wandelgek traveled through East Africa and this included a visit of the Central Highlands of Kenya. This is also one of the wealthiest parts of Kenya because of its fertile soil and mild climate (less hot, more rainfall). The Central Highlands or White Highlands, stretch from the north of Nairobi roughly to, Nanyuki. This includes the highest part of Kenya, Mt. Kenya which is located in the central highlands. It is the homeland of the Kikuyu people. 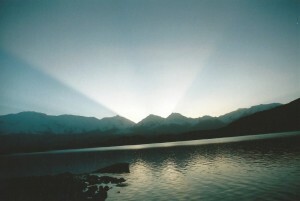 Due to the altitude, the area has a more than excellent climate. Thanks to the climate everything grows and many white people who were involved in the construction of the railway to Uganda later settled in the area as a farmer. The whole area is well developed in terms of infrastructure. There is an excellent road network, there are good rail and bus connections which transport you quickly and to almost everywhere more or less comfortable. Only the northernmost part, especially between Nanyuki and Nyahururu may cause transport problems. For local connections, you have to rely on matatus. The Aberdare Mountain Range (formerly the Sattima Mountain Range, Kikuyu: Nyandarua) is a 160 km long mountain range of highland, north of the Kenyan capital Nairobi with an average altitude of 3,500 meters (11,480 ft). 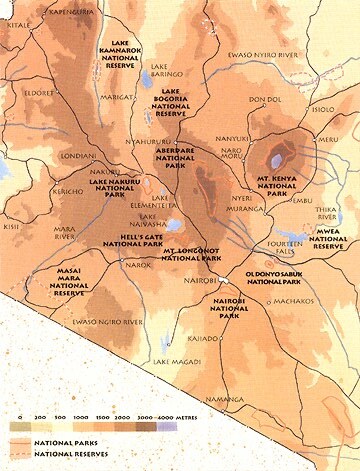 It is in Nyandarua County, in central-western Kenya, northeast of Naivasha and Gilgil and just south of the equator. The Aberdare Range is part of the eastern edge of the Great Rift Valley and runs roughly from north to south. On the west side the hills descend steeply down to the Kinangop Plateau and then in the Great Rift Valley. In the east, the mountains gradually decrease. 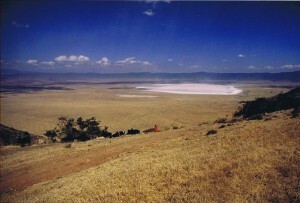 Lake Naivasha and the distant Mau Escarpment can be seen from the peaks. The mountains have a maximum height of 3999 meters (13,120 feet) above sea level and are heavily wooded. 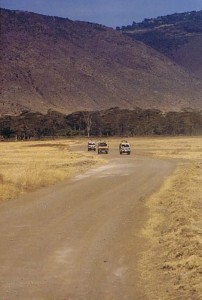 The former name of the mountains survives in Mount Satima (‘the mountain of the young bull’), the highest peak in the Aberdare Range. 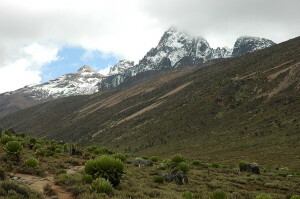 The second highest peak, at the southern end of the mountains, is the mountain Kinangop 3906 meter (12,815 ft). Mount Kenya, 5199 meters (17,057 ft), is the second highest mountain in Africa after Kilimanjaro and is located east of the Aberdare Range. The Aberdares are the reservoir area of the Sasumua dam and the Ndakaini dam, which supply most of the water for Nairobi. The mountain forests are watersheds for the Tana River, the largest river in Kenya, which supplies water to the Seven Forks hydropower plant, which generates more than 55 percent of the total electricity production in Kenya. 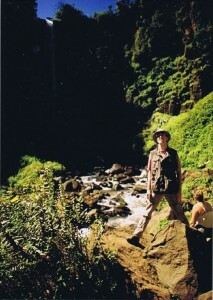 The Wandelgek visited the Thomson Falls near Nyahuru in the Aberdares. Mount Kenya or Kirinyaga (= Shiny Mountain) is the highest mountain in Kenya and with its 5199 meters, the highest mountain in Africa, after Kilimanjaro. The northern slopes of the mountain are on the equator. The peaks are the hardest remnants of an extinct stratovolcano that was active between 3.1 and 2.6 million years ago. 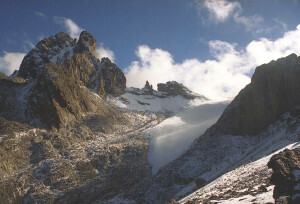 On the slopes around the three highest peaks-Batian (5199 m), Nelion (5188 m) and Lenana (4985 m) – remain a dozen glaciers. On September 13, 1899 a Brit, Halford John Mackinder and the Italians Cesar Ollier and Josef Brocherel, climbed the highest Kirinyaga peak, Batian. Lenana is the most climbed mountainpeak. On nice days, dozens of people scramble to the top. From 1949 onwards, the area around the mountain is a national park. The park serves the interests of tourism, the local economy, biodiversity and water resources of the region. Since 1997, the park is on the UNESCO World Heritage List. Ten million years ago, an immense part of the country sank back, stretching over a length of 6400 km from Jordan and the Red Sea through the southeast of Africa, to the plains, which is now known as the Great Rift Valley. At the edge of the valley, the plateau landscape rises gradually, but then drops to a height of 900 m in a series of fault lines in the rocky ground. In some areas of the East African part of the Rift Valley, like in Tanzania, the traces of this gigantic earth movement, obliterared due to erosion, but elsewhere you’ll still have steep cliffs at the edge of fantastic wide valleys – desertlike worlds about 50 to 65 km wide. At these places are unique ecosystems caused by the shelter which the separation has made possible,.developing an exceptionally rich fauna. In the west tropical rainforests developed, but the areas where the rain was blocked by the mountains, developed into dry grasslands, savannas, and the heart of the East African safari landscape. The valley consists essentially of a series of troughs and hills along the fracture lines. The troughs are on average 40 km wide and are located on the western branch of the valley filled with fjord-looking lakes, some of which are below sea level, such as the Tanganyika lake – after the Baikal Lake, the deepest freshwater lake in the world – which occupies an area of 32,900 km2. 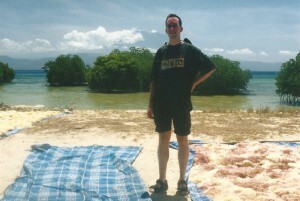 On the shores of this lake are beautiful beaches where wild animals come in abundance. 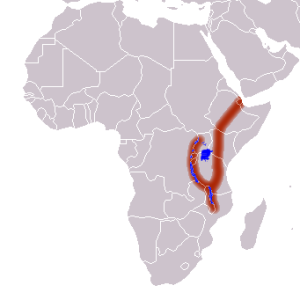 In eastern Africa, the valley splits in two parts; the Western Rift and the Eastern Rift. Along the Western Rift, sometimes also called the Albertine Rift, are some of the biggest mountains of Africa located, especially the mountains of Virunga and Ruwenzori Mitumba, but also the lakes of the Rift Valley are located here. These lakes are among the deepest in the world, with the deepest point being 1,470 meters deep in Lake Tanganyika and Lake Malawi. Lake Victoria, the second largest lake in the world, is also considered to be one of the Great Rift Valley lakes, although it actually lies between the two arms and is much less deep. The formation of the Great Rift Valley is still proceeding. In the future, East Africa, according to many scientists will suffer the same fate as Madagascar 65 million years ago. After approximately ten million years, East Africa will have separated from the rest of Africa and form a new continent. The area is seismically and volcanically active, which is visible at high volcanoes like Mount Kilimanjaro and Mount Kenya. Even further north, in Ethiopia are many volcanoes. In the eastern branch of the East African Rift Valley in Ethiopia, Kenya and Tanzania, are shallow salt lakes like the Natron Lake. The alkaline water contains very few fish, but algae and other microorganisms are a major attraction to the clumsy flamingos, which arrive all at once in flocks of thousands in pink, contrasting against the reflective surface of the lake and the relentless blue sky. In this eastern branch there’s also some increase in volcanic activity in places where molten rock cracks through the thin continental crust and creates volcanoes, such as the Ol Donyo Lengai – “Mountain of God” for the local Masai population – Mount Kilimanjaro and Mount Kenya. Those who climb Kilimanjaro – with its 5895 meters the highest mountain in Africa – pass all vegetation zones from desert through tropical forest to perennial snow. West of Ol Donyo Lengai in Tanzania is the Serengeti steppe, whose dusty soil is probably due to descending volcanic ash. On these endless grassy plains live African elephants, giraffes, zebras, wildebeests, impalas, antelopes, as well as their predators: lions, leopards, cheetas and hyenas. Every year in July and August more than one million wildebeest migrate from the area north of Tanzania’s Serengeti National Park to the Mara River in Kenya. Seeking the fresh green pastures as a result of abundant rainfall, clumsy animals draw on in the company of elegant zebras, galloping or sequentially. If it starts raining again in November, they migrate back to the south to Tanzania. There are other animals that migrate, but nowhere in Africa is this done on such a massive scale and is the migration so easy to follow. You can even rent a hot air balloon to follow the spectacle from the air. When the Wandelgek passed through East Africa in 2002, the Ngorongoro Crater was truly one of the absolute highlights for spotting animals. The Ngorongoro Crater is the largest intact caldera (collapsed volcanic cone) in the world. It is located northwest of Arusha in Tanzania at 2,200 meters above NAP. This volcano is believed to have arisen from a volcano that must have been approximately five miles high 2-3 million years ago. The crater has a diameter of 17-21 kilometers and the crater floor occupies an area of ​​about 260 square kilometers. The edge of the crater is about 600 meters above the crater floor. 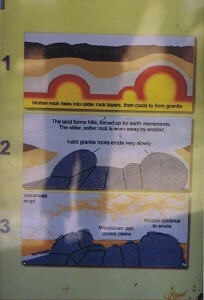 This creates different climate zones in the crater. In the center of the crater is a salt lake. The crater wall which shields the area of ​​the crater is very effective against the accidental migration of the animals. The lion population has thus a strong inbreeding. another reason for inbreeding is the presence of the Masai just between the crater population and the other populations of lions, which makes it impossible for both populations to meet. On the other hand migratory herd animals like wildebeests visit the crater. An estimated 25,000 large mammals live permanently in the crater and at the peak live another 500,000 mammals. This is one of the most densely populated areas in the world of game. The Ngorongoro Crater was part of the Serengeti Nature Reserve since its creation in 1951 and in 1959 became an independent nature conservation area. 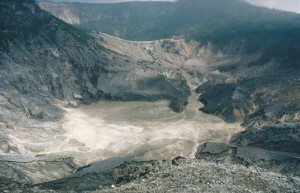 Since 1979, the crater is on the UNESCO World Heritage list. Almost all large African animals are found in the crater: zebra, wildebeest, black rhinos, elephants, lions, cheetahs, and hippos. The wildebeest population in the crater does not participate in the great migration between the Serengeti and the Masai Mara. A notable absentee is the giraffe: their long neck and long legs, make it impossible to descent the steep crater walls to the bottom of the crater. Crocodiles, impalas, antelopes and winch oribis do not enter the crater. Also female elephants with calfs are not seen in the crater because of the lack of trees which provide food. However, theu are present on the forested crater walls. Kilimanjaro is a freestanding mountain massif of 60 by 80 kilometers which is formed by three stratovolcanoes, located in the Kilimanjaro region in northeastern Tanzania, about 3 degrees south of the equator. 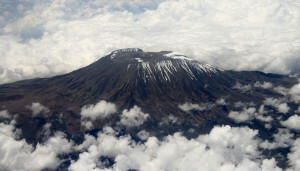 Kilimanjaro is the highest mountain in Africa and therefore comes within the ranks of the so-called “seven summits”. The mountain extends more than 5 miles above its surroundings and is the highest freestanding mountain in the world. 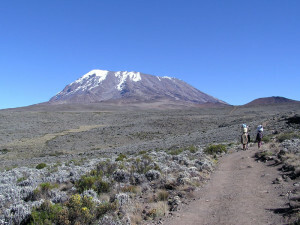 The largest and highest volcano Kibo (5892 m), is flanked by Shira (3962 m) and Mawenzi (5148 m). On the mountain there are about 250 craters. One of the largest is the caldera Kibo, which has a diameter of approximately 2 ½ km. 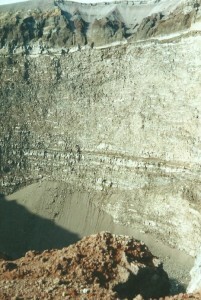 In the caldera is the Reuschcrater, and therein lies the most recent crater, the Ash-Pit. 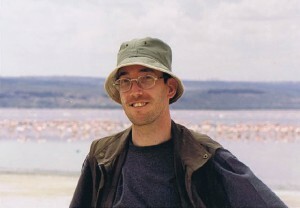 On the southeastern slope of the Mawenzi, the Chala lake fills a 3 km ² large crater. About 2 km ² of Kibo is covered with a small glacier, the ice was at the end of the 19th century, five times as large. The highest point of the crater rim of Kibo is Uhuru Peak (Uhuru means freedom in Swahili) and is 5895 m above sea level. In 1889, Hans Meyer and Ludwig Purtscheller and their mountain guide Yohani Kinyali Lauwo found a route to the top. In 1912 Fritz Klute and Edward Oehler climbed the highest Mawenzi summit. 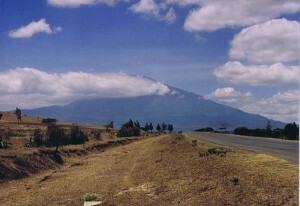 Mount Meru is located in the center of Arusha National Park. The slopes are fertile and rise above the surrounding savanna. The forest is rich in wildlife, including nearly 400 species of birds, and also monkeys and leopards. The ascent of the mountain starts at the Momella Gate at 1500 m.. On Mount Meru, there is only one route, and it takes 3 to 4 days. The first day is a walk of 10 km with an altitude of 1000 m to 2500 m. to the Miriakamba hut which is located at the height of the crater floor of the eruption and has a very solid infrastructure. The next day is a steep climb to the Saddle Hut (3500m). The same day it is usually also possible to climb the Little Meru with stunning views over the crater, the ash cone and the Arusha National Park. The peak is climbed on the third day. This trip always starts around midnight to reach the top at sunrise. The steep climb is technically more difficult than the previous day and runs almost entirely on the crater rim to Socialist Peak. The descent can then be finished in one or two days depending on the organization which was chosen to assist in climbing Mount Meru. At the top is a metal flag of Tanzania, two meters high, and a concrete milestone with the inscription “Socialist Peak 4562.13M”. For the ultimate experience of the volcano you stay near Bromo. The next morning you can then see the sun rise. Behind the volcano, which is magnificent. First the land is dark, then it gets pink, red, orange and yellow before the blue colors of the sky start to show. Everywhere you look you’ll see barren, dusty wasteland with huge active volcanoes as backdrop. The volcanic complex of Tengger is an example in which a new crater of the volcano forms within a larger and more ancient caldera. There are five volcanoes in the Tengger Caldera: Mount Bromo (2329 m), Mount Batok (2470 m), Mount Kursi (2581 m), Mount Watangan (2661 m), and Mount Widodaren (2650 m). 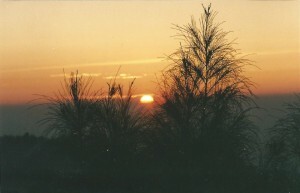 Mount Batok is the only peak that is no longer active, and is covered with casuarina (Indonesian: cemara) trees. Mount Widodaren, located next to Mount Batok, contains the Widodaren cave, which is considered holy by locals. The five volcanoes in the caldera are surrounded by vast expanses of sand called the Tengger Sand Sea, which in turn is surrounded by a steep crater wall of the larger Tengger Caldera with a height of about 200-600 meters. Other mountains around the Tengger caldera are: Mount Pananjakan (2770 m) Mount Cemorolawang (2227 m), Mount Lingker (2278 m), Mount Pundak lembu (2635 m), Mount Jantur (2705 m), Mount Ider-Ider (2527 m ) and Mount Mungal (2480 m). The peak of the mountain Pananjakan is the most popular place for the entire volcanic complex of Tengger to look. Further south in the national park, there is another volcanic complex called the Semeru Group or Jambangan Group. This area includes the highest peak in Java, Mount Semeru (3676 m). Other mountains in this area are Mount Lanang (2313 m), Mount Ayek-ayek (2819 m), Mount Pangonan cilik (2833 m), Mount Keduwung (2334 m), Mount Jambangan (3020 m), Mount Gentong (1951 m) Mount Kepolo (3035 m), and Mount Malang (2401 m). The Semeru forest has many rivers that are former lava streams from Mount Semeru. The group is considered to be very productive in producing volcanic products such as lava, volcanic ash and hot clouds and in spreading them around. The lowest part is surrounded by fertile rice fields. The Semeru (Gunung Semeru or even Smeroe) is with its 3676 meters the highest mountain on the Indonesian island of Java. Like most mountains in the area it is a stratovolcano. 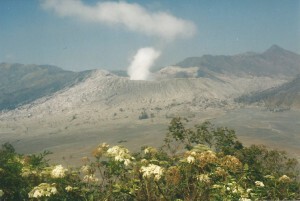 The Semeru is located in the Bromo Tengger Semeru National Park in East Java. 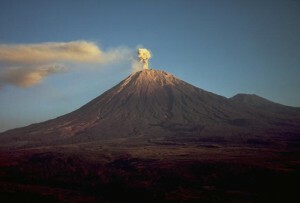 Since 1818, the Semeru erupted 55 times. The most recent eruption began in 1967 and still continues (2007). 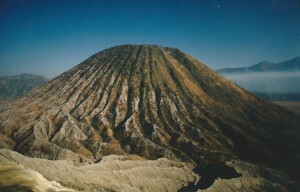 Mount Batok is a mountain located in East Java, close to Mount Bromo and Semeru. The mountain is the only dead or inactive volcanic mountain located in the area of Mount Tengger. Mount Batok is part of the Tengger caldera. Now this mountain has become a tourist area in East Java. In Javanese language, shell means “coconut”. Inhabitants of the Tengger region believe that Mount Batok is formed from one. The mighty giant Sage Bhima, overthrew / kicked against a coconut after he was rejected by the stunning woman Roro Anteng. Bromo is the most famous volcano on the island of Java, Indonesia. The mountain is with its 2392 meters height certainly not the highest mountain in the region, but the location is very special. The volcano is located along with two other volcanoes in a sea of ​​sand abou 8 to 10 kilometers wide. Bromo is part of the Tengger massif and is located in the Bromo Tengger Semeru National Park that is located in East Java. A popular activity is to watch the sunrise from the rim of the crater of Mount Bromo, amidst the enchanting lunar landscape. The walk starts in the middle of the night from a hotel near the crater. 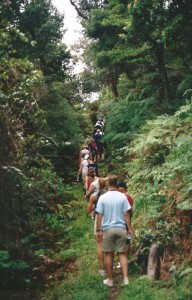 After about an hour’s walk you’ll reach a staircase to the crater. 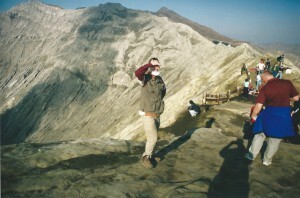 That a volcano is unpredictable was shown in the summer of 2004, when the Bromo suddenly erupted. There were two deaths (tourists) and two people were injured. It is very easy to reach and climb the Tangkuban Perahu on West Java. During that climb, you’ll walk through the only remaining ancient forests of Java, which is (except in volcanic areas) almost entirely in cultivated. Tangkuban Perahu (translated: inverted canoe) is an active volcano near the city of Lembang located 30 km north of the city of Bandung, the provincial capital of West Java, Indonesia. 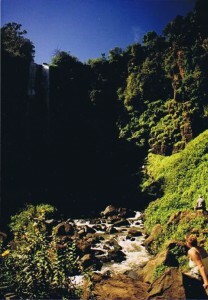 It is a major tourist attraction, you can make a walk or take a trolley to the crater rim. There are hot springs in the vicinity, in which it is possible to cook an egg. The volcano is 2084 meters high and last erupted in 1983. On the crater it smells like rotten eggs from the sulfur fumes from the crater but also from different cracks in the caldera, but there’s also the final piece Javanese primeval forest. 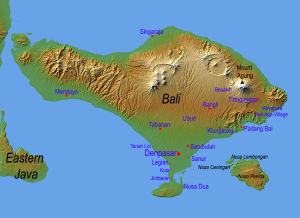 Bali is an island of volcanoes (like Java). 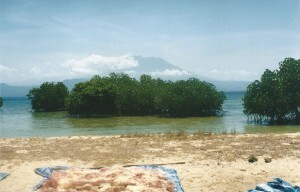 The highest is the Mount Agung volcano, which is visible from miles around. The Wandelgek visited the crater of Gunung Bratan, which is a crater lake located.On the east side of the island of Bali. The huge volcano Gunung Agung rises above the tops of the green trees. 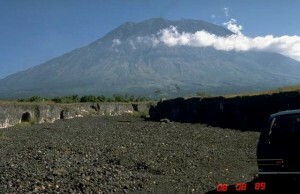 Slightly northwest of Agung is a huge crater formed in prehistoric times. It includes the slightly smaller volcano Gunung Batur. There is a crater lake and several smaller craters. 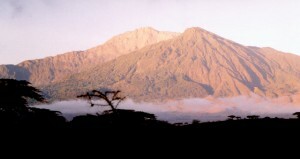 Both Gunung Batur and Gunung Agung can be climbed in one day. Agung (Indonesian: Gunung Agung) is a moderately active volcano on Bali in Indonesia, which is the highest mountain on the island. The Dutch used to name the mountain the Peak of Bali. Gunung means mountain and Agung means grand, lofty or head. Agung is located in eastern Bali, with the peak northeast of the great temple Pura Besakih. The foot of the mountain reaches in the northeast out to sea, and on the southeast side are a pair of small, extinct volcanoes. 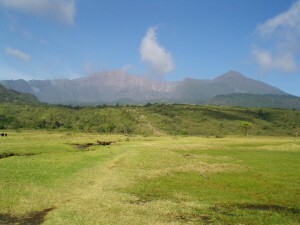 A small valley separates the Agung from the adjacent volcano Gunung Batur. The lower slopes of the mountain are very wooded and agriculture is located up to a height of about a thousand feet. Because the Gunung Agung is seen as the residence of the gods, eruptions are seen as a sign of their displeasure. But the eruptions make the surrounding land fertile, and the rivers that spring from the Agung irrigate the rice fields. A major eruption in 1350 created the fertile land around Besakih and made sure that the rice yield was large enough to provide food for many years to meet the needs of the temple complex. After this eruption, little activity took place in the years 1808 and 1843. In 1963 and 1964 were the last eruptions of the Agung after a rest period of 120 years. Some villages were destroyed and an estimated 1,600 people were killed. Another 86 000 others were left homeless. These people were evacuated to other parts of the island, where problems arose due to overpopulation and political chao. Many refugees then ended up in camps in Central Sulawesi. But the lava flows missed the temple Pura Besakih on the slopes of the volcano for only a few steps, and this was seen by the people of Bali as a wonderful favor of the gods. Today, the black slopes of the Agung are again covered with fields and gardens. However, the mountain remains active. Sometimes the large, deep crater emits more smoke and ashes, and volcanologists closely watch this geological activity closely watched. Bratan (Indonesian: Genung Bratan) is a volcanic caldera with three lakes on the Indonesian island of Bali in the province of Bali. 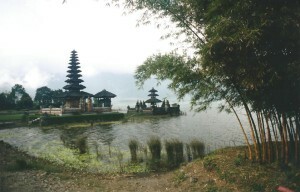 At the edge of the lake is the Hindu temple Ulun Danu. In 2010 The Wandelgek crossed the Seizer Alm and saw the two high peaks of the Sciliar massif, the Monte Pez and Sciliar peak. 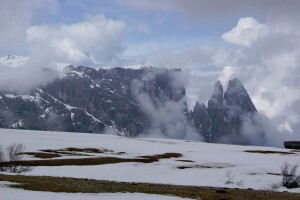 The latter is one of the many spectacular peaks that give the dolomites such a striking appearance. More barren than other parts of the Alps. The Seiser Alm is in the Italian part of the Alps in the Trentino – Alto Adige region. The Monte Pez, which is part of the Monte Sciliar has a top of 2563 meters. Monte Sciliar (Schlern) 2461 m.
Mount Sciliar or Schlern in South Tyrol, with its 2461 meters is a majestic appearance in the Dolomites. The Sciliar is enclosed by the Ortisei Rosszähne and Rosengarten Gruppe and is near Siusi allo Sciliar (Seis am Schlern). 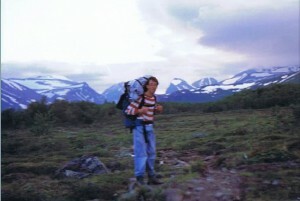 The Wandelgek did a trekking through te Scandinavian Highlands in the summer of 1993, a trekking over the Kungsleden, through the wilderness of the highest part of the Scandinavian Highland. Although the mountains barely reach above 2000 meters, the climate, caused by its location above the Arctic Circle, is a mountain climate. Even in mid-summer there is still plenty of snow and ice, for example at the highest point on the Kungsleden, the Tjaktjapas (1150 m). If you make such a trek in midsummer, you also need warm clothing. 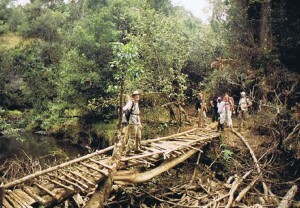 Maybe not every day, but on a multi-day trekking it’s certainly a necessity. The scenery is absolutely spectacular, tundra with beautiful flowers, to snow bridges over fast flowing rivers and frozen glacial lakes. 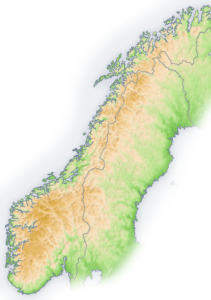 The Scandinavian Highland, the Scandinavian Mountains or the Norwegian mountains (Swedish: Skanderna, Fjällen or coal; Norwegian: Kjølen) is a mountain range that runs roughly going from north to south over the Scandinavian Peninsula. The western flank of the mountains drops off into the North Sea and the Norwegian Sea, where the famous fjords of Norway have formed. However, the eastern flank is gradually decreased toward the Gulf of Bothnia and northern Finland, and is for the most part in Sweden. In the extreme north of the Scandinavian Highlands, where the borders of Norway, Sweden, Finland and Russia meet, in the vicinity of the North Cape, the mountains are more like rolling hills. The mountains of the Scandinavian Highland are not very high. 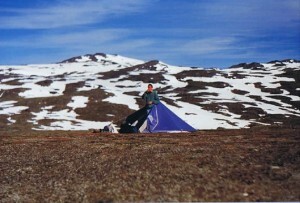 Galdhøpiggen in Jotunheimen, in the south of Norway, with a height of 2469 meters the highest mountain. Then there are the mountains Hurrungane, Breheimen and Trollheimen. However, the combination of the northern latitude and humid climate under the influence of the North Atlantic make sure that there are many ice fields and glaciers located. Furthermore, the Kebnekaise, with a height of 2103 meters is the highest mountain on the Swedish side and the Halti with and height of 1328 meters the highest mountain in the relatively small Finnish part of the Scandinavian Highland. 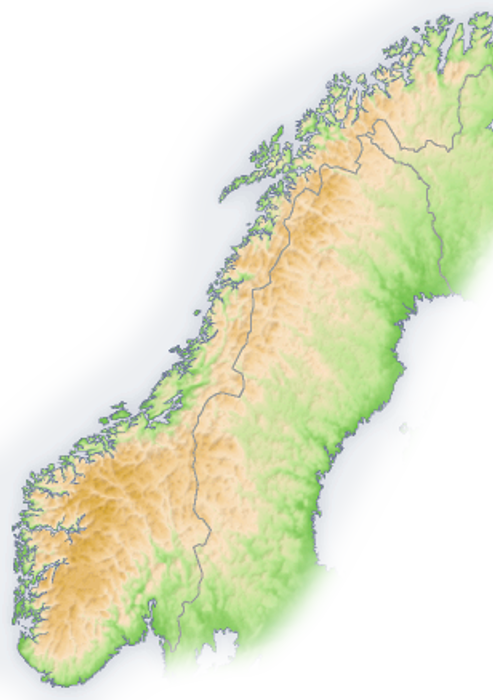 In southern Norway, there prevails a mountain climate, with on the Atlantic coast a temperate climate, throughout the East of the mountains and in the central part a continental climate prevails and in the north a tundra climate. The mountains with the exception of the extreme south, north and the higher parts are heavily forested with pine forest and these forests are also the westernmost foothills of the Eurasian taiga. 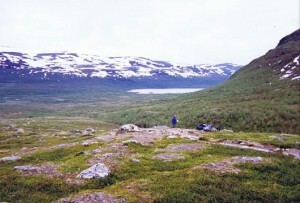 However, the extreme south of Norway consists of deciduous forest and mixed forest, and the upper parts and the north consist of tundra. 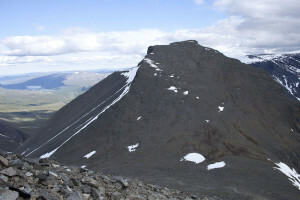 Kebnekaise (Sami: Giebmegáisi or Giebnegáisi) is a mountain in Sweden, which is the highest peak of the country. The higher of the two peaks is the south peak. 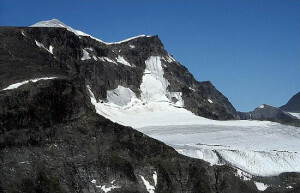 This includes a glacier, so the height varies and, on average, is reduced. The earliest measurements in the early 20th century, giving 2121 meters, but in 2004 it was measured 2103 meters. The average over the period 2000-2009 is 2106 meters, which is the value indicating the latest edition of the official maps of the Swedish Lantmäteriet (topographical service). The northern peak is 2097 meters, which is also the highest bedrock in the country. The mountain is located in Lapland, about 150 kilometers north of the Arctic Circle and west of the city Kiruna, not far from the border with Norway. He is part of the Scandinavian Mountains. He is also known outside Sweden because there are many nearby walking paths, and because he is in the book and cartoon series Nils Holgersson by Selma Lagerlof where Kebnekaise plays an important role as the birthplace of Akka, the leader of the group of geese that travels with Nils. On March 15, 2012 during a large-scale military exercise near the mountain a Norwegian C-130 military aircraft crashed during a flight from Evenes to Kiruna. All five crew members were killed. It is believed that the crash was caused by bad weather around the mountain; The plane disappeared from radar. 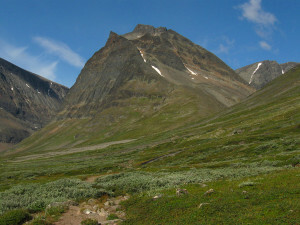 Tolpagorni or Tuolpagorni, Northern Sami Duolbagorni, is a high mountain in the Kebnekaise massif in the municipality of Kiruna, with a characteristic crater at the top. Tolpagorni is the most eye-catching top that you encounter in the valley Ladtjovagge. 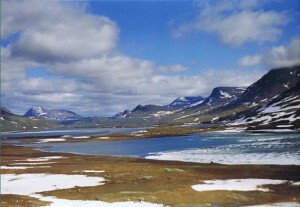 Situated between Singitjåkka and Kebnetjåkka. Tolpagorni provides a clear silhouette against the sky with Vierramvare in the background. Tolpagorni is 1662 meters high and at the top there is a depression in the rock, just below the summit. This depression is round like a cauldron, and reminiscent of a volcanic crater, but this is not the case. In spring, melted ice water in a lake at the bottom of the cavity, spills over the edge of the caldera and flows down into the valley, where it is gathered. 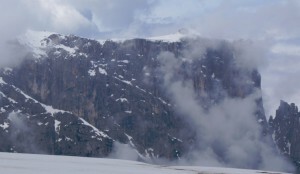 The crater is a remnant of a niche glacier. 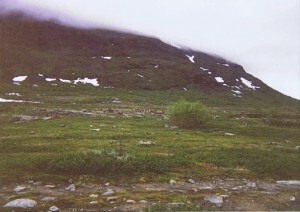 In the east of the mountain the river Kittel flows down to flow into Láddjujohka. The name Tolpagorni was initially given the name “Kebne Kaise” by the Sámi, which means “our boiler”. On a map from 1832, the name Tolpagorni was indicated. When they found out that the highest mountain was not the most striking mountain, the highest mountain in Sweden actually was renamed Kebnekaise, with a new name created for the Tolpagorni. 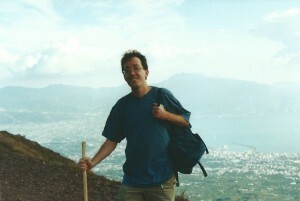 During a backpacking trip through Italy in the late summer of 2001, the Wandelgek climbed Vesuvius, after he had visited Pompeii a few days earlier. From Pompeii it is wonderful to see the volcano and its history, he has something menacing about it. The Wandelgek has been up on the crater rim of Vesuvius itself. If you do not want to take a taxi or the Vesuvio Express to Vesuvius and / or you want a sporting challenge, you can walk/climb Vesuvius. You can go by bus 5 to the last stop at the bottom of the volcano and walk from there to the parking lot of Vesuvius. However, the Wandelgek had a better and cheaper idea. There are also taxis at the bottom of Mount Vesuvius and of course, a taxi is more expensive than a bus, but not if you share the cost with other walking travelers. The climb takes 1 to 1.5 hours if you do not take breaks. The climb is because of the beautiful views over Naples definitely recommended. On the return trip, the taxi driver gave us some pieces of sulfur stone from the crater of Vesuvius as a present. I wouldn’t expect this from the bus driver. The view over the bay of Naples is gorgeous, but it does get you thinking about how incredibly close this metropolis is situated next to the dangerous Vesuvius. 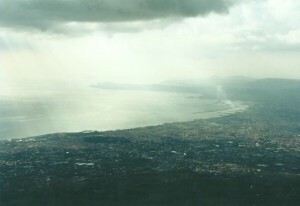 Vesuvius is a volcano on the west coast of Italy, southeast of Naples. The name “Vesuvius” is derived from the Oscan “fesf” which means smoke. The volcano is located in the plain of Campania, has a diameter of 8 kilometers and is 1281 meters high. 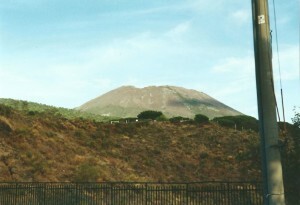 Vesuvius is one of the 16 Decade Volcanoes designated by the IAVCEI associated with its history of large eruptions and nearby residential areas. 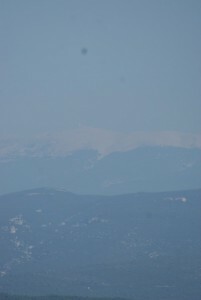 The Wandelgek saw Mont Ventoux on several occasions during his trekking through the Luberon Mountains in 2011. Mont Ventoux is a mountain in the Vaucluse department in southern France, located some twenty kilometers northeast of Carpentras. This peak of the Massif des Baronnies in Provence-Alps is the only one of this height (nearly 2000 m.) in the region of Provence, and it is therefore sometimes called the Giant of the Provence. The name ‘Mont Ventoux’ is derived from the Occitan word guy that means wind and would be dedicated to Vintour, a Celtic (Ligurian) god of the wind. There are at the top of the mountain wind speeds up to 300 km / h recorded. Another explanation of the name dates from the 1st or 2nd century AD. The Gallic name allows to reconstruct itself as “Ven-top (s)”, which means’ snow summit. In the 10th century, the names Mons Ventosus and Mons Ventorius appear. In the region, the wine A.O.C. Ventoux is made​​. 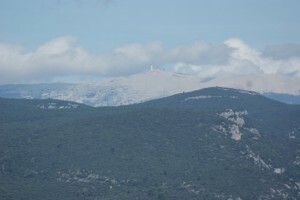 The summit of Mont Ventoux lies at 1912 meters altitude. 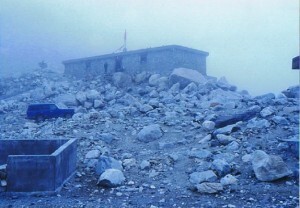 The height of the base of the mountain at 1614 m. On the top of the mountain there is a weather station with a big tower. The mountain is known for its ascent because it has been repeatedly recognized in several prestigious cycling races such as the Tour de France, because of the difficulty and barren “moonscape”. The ascent on foot was already described in the Renaissance by Petrarch in his ascent of Mont Ventoux.